They mayor of Toronto has really messed up this time. Instead of bidding for the Pan Am Games, he bid on the Panem Hunger Games, a battle royale born from the hybrid of perennially popular franchises “The Hunger Games” and “Jurassic Park.” As the characters from both worlds come together, they must fight for survival against seemingly insurmountable odds. That’s the premise of Queen’s Players Toronto‘s new show, The Jurassic Games, currently playing at the Tranzac Club. Part sketch comedy, part keg party, The Jurassic Games is a brilliant parody of politics and pop culture. It’s fresh. It’s interactive. And it’s all for a good cause, with some of the proceeds going to support The Princess Margaret Cancer Foundation, Camp OOCH and Femme International. If you’ve never been to a Queen’s Players Toronto show, here’s a quick rundown of what to expect. Alcohol definitely plays a large (but optional) part in the performance. Most of the audience is enjoying a few (or many) drinks, but so are actors and band members. Even some of the scripted dialogue revolves around chugging down a pint or two. Think of the night as one long drinking game, with several long-standing cherished traditions. Every time an actor forgets or stumbles on his or her lines, you yell “scene.” When they mention the name of a song, you shout “sing.” And if you’re particularly impressed, you pass the actor a drink. Now, you’d think with all this alcoholic merriment, the calibre of this production wouldn’t be very good. But that’s where you’d be mistaken. Here’s a dollar for your troubles. And you said you’d never get four quarters out of the Raptors. The humour definitely skews younger, referencing TV shows, movies and bands that are particularly popular amongst a 20-something crowd. You don’t necessarily need to understand all the pop culture references to have a good time, but they do make up the backbone of the dialogue. What really made me enjoy this show was the strength of the acting. These talented young actors bring their comedic A-game, and share an on-stage rapport and camaraderie that’s a real pleasure to watch. Effortlessly riffing off one another, they all picked up on each other’s comedic cues without missing a beat. The best part? Nobody takes themselves too seriously. I’m honestly not a fan of shows that claim to be comedies, but everybody in the cast acts rigid. Luckily, there was none of that here. In fact, you almost wanted a cast member to fumble his or her lines, so that you could see just how fast they could chug down a pint as punishment, with the crowd cheering all the while. Everybody in that room was there to have a good time, and that created a party-like atmosphere of infectious good will. If you’re looking for serious, traditional theatre, look somewhere else. But if you’re looking for a fun, interactive, and casual theatre experience, this is the show for you. 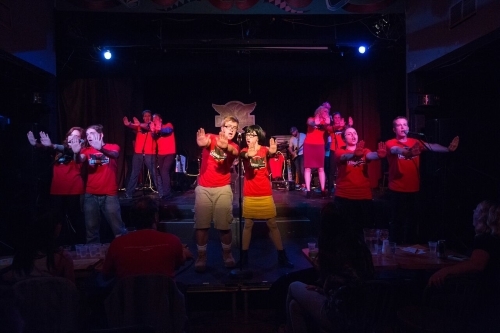 The Jurassic Games is a booze-soaked ride that offers non-stop, light-hearted laughs throughout the entire performance. I loved this show, and if you like your comedy to be random and rowdy, I think you will too.